My kids are a bit hyperactive. Trying to teach them something meditative and spiritual can be a challenge--a challenge requiring creativity. Here's one thing my kids love. They love to jump on our huge trampoline. And they love adult attention. The combination of adult attention and the trampoline, jumping with an adult while doing an activity is seriously motivating. So, I use this to teach them many necessary things, whether it is foreign language vocabulary for school, math facts or Pagan concepts. If you can yell it in rhythm, the trampoline will teach it. Count to ten or twenty in a variety of languages. Sing the days of the weeks, the months, the Wheel of the Year, the multiplication tables, spelling words, whatever. The trampoline is a great memorization tool. Here is my latest inspiration from trampoline time, a rhyme for leaning the elements and quarters. I hope it may be helpful to a few others. South for will and joyful play. West for love, sorrow and soul. North for my body, strong and whole. Why do our kids need contemporary Pagan stories? "Just don't say 'Solstice' where anyone can hear you, Mom," a fifth-grader says. "Everyone says 'Christmas' - even the people who have other holidays." This is the kind of thing you will hear, if you're an earth-centered parent living someplace multicultural enough that you would actually consider using Pagan terms in public. This is a fact. We live in a society where the majority culture is very strong in the media and public space, despite the fact that only about half of the population shares that culture. You want a Pagan children's story? Here are some of the beautiful illustrations by Julie Freel from the soon-to-be-published story Shanna and the Raven. Ten-year-old Shanna and seven-year-old Rye learn to use the magic and energy of Imbolc for protection in a dicey situation. I grew up Pagan in a conservative, rural corner of the United States. Wait... I have to amend that because my mother is likely to lodge a complaint. I grew up with many Pagan ideas, stories, practices and beliefs, but I was nearly thirty before I had a word for it or knew the names of the solar holidays. If and when we did a ritual or used something like Tarot when I was a kid, my mother either didn't overtly talk about it at all or called it "woo woo." By the time I went to school, I didn't have to be told that I should keep quiet about the whole subject of spirituality. When I was sixteen, I had to fill out a form including my religion and I asked my mother what I should say. She said, "You better say Protestant just in case." I knew we weren't Protestant, but I put it on the form anyway. The only options were Catholic, Protestant, Muslim and Buddhist. There wasn't even an "other" category in those days. I was tempted to mark the Buddhist category just to buck the system, but it was an important form, so I decided to take my mother's advice and keep my head down as I did at many other times. As a result, I understand why many Pagan kids are worried about being publicly identified as non-Christian, let alone Pagan. Sure, it can be considered brazen and cool among teenagers, but at earlier ages, both teachers and other kids often react negatively to open use of Pagan terms or symbols. Kids listen to the news and to the way people talk. And they take their cues from the media. Today's kids can relate to to Shanna and Rye because they are just like them, going to school, having fun with friends and thinking about how they fit in. While the film Frozen may drop many Pagan hints, it stops short of using any Pagan terms. Meanwhile, the majority of stories and films encounter Christmas or other Christian terms and integrate them with ease. These terms pervade the common media culture and make clear what is "normal" for kids. Some kids will be strong inside and not care much. I didn't. I kept my own beliefs and sat through plenty of public and semi-public Christian prayers throughout my childhood. But I always felt the coldness of the outside world and the isolation of my family. I struggled to find words when I traveled in my teens and people asked me "what" I was. When I came close to being able to describe it, I was met with a wall denial: "That's not a real religion." "That's fake." "You just made that up." And I didn't listen. I knew that I hadn't made up the myths of Norse and Greek mythology or the casting of a circle and the calling of quarters. (I knew neither term for those actions but I knew how to do them.) However, I teetered on the edge of despair over it. I envied my Native American friends, who were the only people I knew with similar practices and yet I sensed the wrongness in cultural appropriation at a young age and I refused to go that route. Many more kids will not want to stand so alone. Only a few of the similarly "quiet Pagan" kids I knew growing up retain any of this spiritual path today. And it's fine for everyone to choose their own path. As long as they are happy where they are. The problem I see is that Pagan children are routinely denied a reasonable chance to truly choose. They are told bits and pieces of their parent's spiritual practice, but mostly they are thrown into the world of Christian and secular media. There are a few books about Pagan beliefs aimed at children, but almost all of them are focused on teaching specific facts and practices. They bear little resemblance to the fun and adventurous stories where kids usually find Christmas, Easter and the Fourth of July. The divide is stark - Pagan literature which is often dry and school-like versus pop culture which is fast-paced, fun and focused on Christian and secular terms. The inevitable conclusion that children draw is that Pagan things are stilted and boring, while the majority culture is adventurous and laid back. How did this happen? Paganism is supposed to be the religion of freedom, play, dreams and the natural world, is it not? A holiday story should include the magic and comfort of family traditions but should also include a story to grip and entertain the reader. These stories are for earth-centered kids themselves, rather than meant to educate their classmates about Pagan beliefs. And beyond the issue of what path our children will choose as they mature, I would like to make a plea for childhood free from fear, secrecy and self-doubt. Yes, I was strong enough to weather the great silence and that feeling of isolation alone, but I hope my own children won't have to undergo it. I want them to know what our beliefs are called, to use these terms without fear and to respect other beliefs without feeling dominated. These are key parts of a healthy identity. And without a solid identity we can't freely choose our own path. That's why I am turning my story-telling craft to earth-centered and Pagan children's stories for a time. I am indebted to the writers of Circle Round, Pooka Pages and similar materials for families and children, which have done a great deal to provide Pagan education for kids. This leaves me free to embark on a new path with my stories. These are stories rooted in today's most common Pagan paths, but they are primarily about adventures and difficulties that children actually overcome. These stories are to Pagan beliefs as the American Girl series is to history. 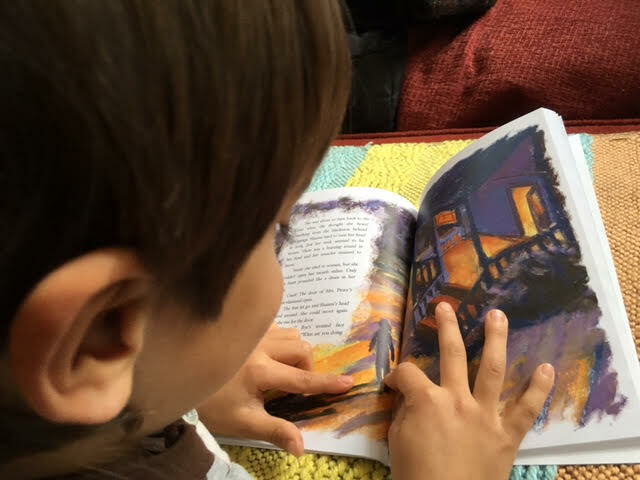 There might be a bit about the facts in the back of the book, but the focus will be on stories that children will actively ask for - stories that will grip the reader with suspense and joy. 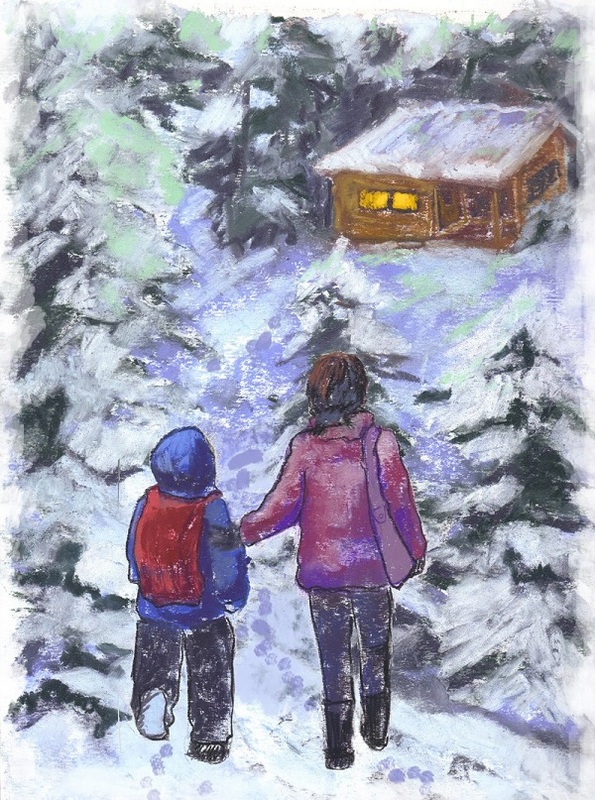 I have begun the Children's Wheel of the Year stories with a book that will be published in January 2016. It's an Imbolc story because it occurs at that time of year and includes a family's Imbolc celebration. It also includes the themes of Imbolc - protection from danger, the good use of intuition and the cleansing of negative energies. But these themes are not taught with a heavy hand. They are part of the story of how ten-year-old Shanna acts bravely and intuitively to protect her younger brother from a criminal. Yes, these stories will encounter some real conflict and suspense. They aren't meant for preschool-age children, but for those who read adventure stories involving an element of danger. The stories that my own children love don't pretend that children are immune to or unaware of the darkness in the world. They are the stories that show children as strong and capable of facing difficulties, protecting themselves and standing up for important principles. That strength comes from facing real problems and battling fear itself. These stories will have happy endings and be empowering for children, but they will involve true conflict and adventure that kids can relate to. "Class, who can tell us what is special about February 2?" the teacher asks. Shanna is excited that someone else knows about Imbolc. But then the other kids laugh and the teacher really meant Ground Hog's Day. Fortunately, the teacher is open-minded and she asks Shanna to tell the class about her lovely traditions. The Children's Wheel of the Year books are meant for kids ages six to ten and may interest kids outside this age range as well. The stories are realistic and contemporary, following a brother and sister named Shanna and Rye whose family follow an unspecified earth-centered path. Like other children today, they go to school, have friends, enjoy fun times and encounter real problems and fears. Like the Magic Tree House books or The Little House on the Prairie, these stories are relatable and fun. They can help in teaching kids about a Pagan path, but their focus is on building a strong and fearless Pagan identity in general, rather than on teaching details of a particular path. 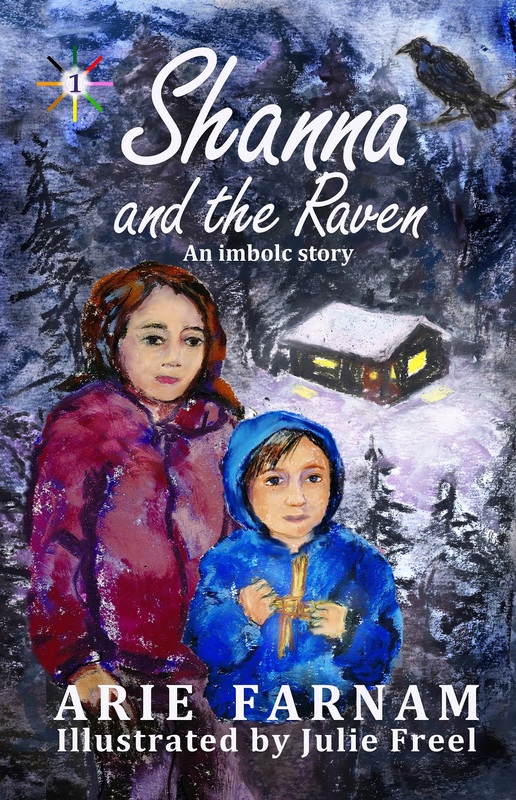 The first book in the series is titled Shanna and the Raven: An Imbolc Story. The series will continue around the wheel of the year. There is no particular significance to beginning at Imbolc. It simply fits the children in the story best. I strive for accuracy in all references to Pagan practices, but I keep much of the specifics out of these stories in order to allow a wide variety of families with different paths to use them. It will be possible to enter the story with any of the books, though there will be a gentle overall story running from Imbolc through Yule as well. If you want to learn more about the Children's Wheel of the Year stories, you're invited to sign up for my Hearth-side Email Circle. Subscribers are entitled to a free ebook, and you can either grab one of my adult fantasy books or Shanna and the Raven as a thank you from me.. Subscribe to get Arie's weekly "virtual cup of tea," updates about books and a free ebook of your choice. No spam. You can unsubscribe any time and no one else gets your address. Reply to my emails and let me know which of my ebooks you want free. I love your comments on these Pagan Notes posts and I would be particularly interested in the ideas and concerns of fellow Pagan parents. What issues are your kids concerned about? What kinds of books, movies and other media do you wish we had for Pagan kids? Thanks for your comments.